Who would nowadays still like to do without the iPad? Within shortest time it has become an integral part in professional and private life. For the iPad Air 4/3/2/1 and iPad mini/mini 2 being everywhere ideally ready for use, xMount manufactures unique holders: High-quality, versatile, clever. No matter whether you are often on the road on business trips using it as a navigation or information tool, whether you would like to entertain your kids on the back seat during holiday trips, whether you require it at the desk, hanging at a wall or for professional application in the showroom, sales room or at trade fairs: With xMount you will find the perfect holder for “your“ iPad Air 4/3/2/1 and iPad mini/mini 2 application for sure! 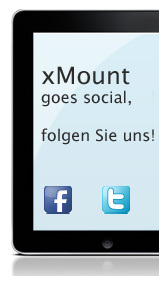 xMount. Your safe, high-quality and versatile iPad 4/3/2/1 and iPad mini holder. xMount, the market-leading iPad Air 4/3/2/1 and iPad mini/mini 2 holder, is an intelligent system comprising various holders particularly developed for the iPad Air 4/3/2/1 and iPad mini/mini 2. xMount increases the usability of your iPad-devices and therewith the pleasure you will have with it. The xMount basis is built by a square holder into which the iPad Air 4/3/2/1 and iPad mini/mini 2 will be inserted and securely locked. This holder, manufactured accurately fitting down to the millimetre, consists of high quality ABS plastics and allows easy access to all buttons, keys and interfaces of your iPad.